Compassion is a precious commodity, especially in healthcare. We see many of our students become nurses and medical assistants because they want to make more than a living: They want to make a difference. A career in healthcare is meaningful work, but it can be emotionally demanding too. If the desire to help others and impact lives was one of the reasons you entered the field, compassion will sometimes be the source of energy that keeps you going. All healthcare workers have to preserve their capacity for empathy, so you need to watch out for these causes of compassion fatigue. A recent article in Critical Care Nurse examined critical care nurses and their levels of compassion and job satisfaction. These nurses, perhaps more than most, experience trauma every day, and that repeated exposure can put them at particular risk of compassion fatigue. The solution, of course, is not to simply avoid this line of nursing work. From their very name, these nurses are critical to saving lives and improving patient health. This means the work can also be particularly fulfilling, but only as long as critical care nurses monitor their own mental health. If you’re a nurse in adult, pediatric, or neonatal critical care, remember that you’re making a huge difference and doing necessary work, but also realize you’re at risk of compassion fatigue. You need to be on emotional guard for losing your compassion for patients, and you need to take care of yourself and your mind as you care for others. Similar to critical care nurses, oncology healthcare workers have been noted to have high rates of compassion exhaustion. The reason is obvious: Nurses and medical assistants who work with cancer patients day after day see a lot of death. That constant loss can sap even the most compassionate healthcare worker in a matter of years, regardless of how impactful the work is. Your efforts may seem futile when you constantly experience loss. That, of course, isn’t true. Oncology and terminally ill patients need and deserve compassionate, dignified care as much as anyone. If you’ve chosen this or a similar line of healthcare work, your reservoir of compassion may be tested, but your sense of purpose should never be. The same survey in Critical Care Nurse found that nurses — and all healthcare workers — who lacked peer support were likelier to experience compassion fatigue than those with a strong, unified team. Your non-healthcare friends and spouse can be a nice escape from the trauma you witness at work, but you need your peers to process your grief and your confusion, because they know what you’re going through. Often, they’ve experienced the same thing themselves, and their support can sustain and even replenish your compassion when you feel drained. You’ll experience it at some point in any healthcare job: A manager you knew and loved leaves, and their replacement will be a manager who doesn’t know the role, the hospital, or the team as well. This kind of change is inevitable, and often it can ultimately be beneficial to staff, but the transition period puts more pressures on you and your coworkers. You may feel a lack of guidance and assistance, or just more tasks in addition to your normal duties. Either way, new management can stretch healthcare workers thin, at least for a few weeks, and in that time you’re more likely to experience fatigue. There will be times (like in periods of transition) when your work will be stressful, but this can be managed as long as you have time to recharge at home. If you don’t, or if your home life adds additional stress, this will exacerbate the normal challenges of working in healthcare, which can inhibit your ability to feel compassion. As a healthcare worker, you need to be able to separate the emotions you experience at work from those at home in order to continue working and living well. If you find yourself stressed even before you put on your scrubs, identify the cause at home, and address it. At Ameritech, we know how important this work is, so we try to equip all of our graduates with the tools they need to succeed for the rest of their lives. 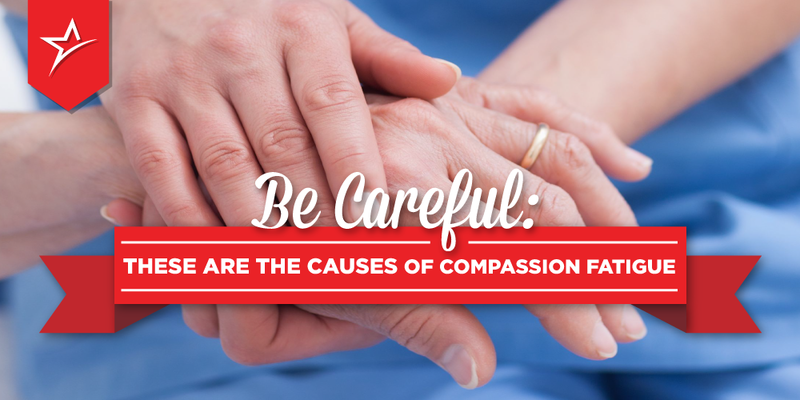 Nurses and medical assistants run on compassion, so they need to be aware of how to protect that. To learn more about our programs and training, contact us today!